With even Morgan Stanley openly discussing whether the Fed will "make the market happy", it now appears that the Fed tightening is effectively over with the Fed Funds rate barely above 2%, and the only question is whether the Fed will cut rates in 2019 or 2020 - roughly around the time the next recession is expected to strike - and whether the balance sheet shrinkage will stop at the same time (and be followed by more QE). To be sure this new consensus was reflected in both equity and credit markets, both of which cheered the Fed's recent dovish U-Turn, and recouped all their losses since mid-December. And yet, market paradoxes quickly emerged: for one, rates markets yawned. On December 31, rates were pricing no Fed hikes over the next two years. Today, after the Fed’s big ‘change of tone’, expectations are almost exactly the same. Second, a material disconnect has emerged between front-end pricing (no hikes) and the level of 10-year real rates (near seven-year highs). If, as Morgan Stanley's Andrew Sheets notes, "one of these is right, the other seems hard to justify." Then there is, of course, the lament about the neutral rate being so low - and the potential output of the US economy so weak - that it can't sustain nominal rates above 2.25% - incidentally we explained back in 2015 the very simple reason why r-star, or the real neutral rate, is stuck at such a low level and is only set to drift even lower: record amounts of debt are depressing economic output, as the following sensitivity analysis showed. Bank of America touched on this key concern last week when it said mused rhetorically that "if the US rates market is right, this would suggest that potential growth is much, much lower than generally accepted." Which, to anyone who read our 2015 analysis, should have been obvious: after all there is too much debt in the system to be able to sustain material rate increases. If Fed Funds target rates of 2.00-2.50% are enough to cause the economy to go into recession, with inflation having normalised at around 2%, then potential growth would seem to be less than 50bp. Alternatively, when looking at where the USD OIS curve regains positive shape and flattens out (in the 7-10 year forwards) the market price for neutral rates again seems to be as low as 2.00-2.50%, leading to the same conclusion. If the above were true, every asset bar rates is massively mispriced. And the punchline: "If we accept market pricing, then there is no shortage of inconsistencies to take advantage of. If the world is going into a severe slowdown, then the Fed is unlikely to wait until next year to cut rate." What this means stated simply, is that while stocks may be rejoicing that the Fed shifted from hawkish to dovish, this may prove dangerously near-sighted, especially if the Fed is indeed concerned about about a major recession breaking out, an outcome which will have devastating consequences once the current short squeeze ends as does the vicious snapback bear market rally, and stocks resume pricing in a global contraction. All of this brings us to a note from Citi's Jeremy Hale, who like Morgan Stanley, agrees that while equities may indeed need Fed help, it is indeed the question whether the Fed will help, and frames the response as follows: "Maybe if the equity market portends weakness in the economy. Does it?" And this is where we find why the Fed is now trapped, at least when it comes to the Fed's reaction function... and the market's response to the Fed's response. 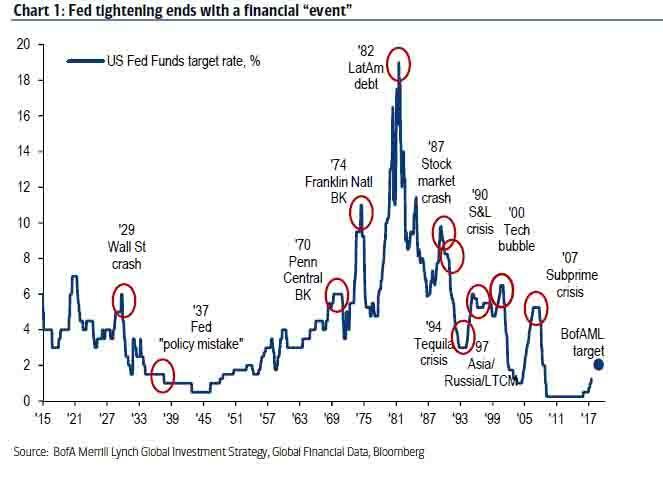 The problem is simple: for the Fed, the sequence of events during past recessions has been: Fed cuts, the SPX crashes, Fed cuts. So, as Citi notes, the SPX crash is a symptom of greater economic weakness rather than the cause. Of course, it's a bit more nuanced than this, because as Citi also shows, for all three slowdown periods the sequence of events is: Fed hikes, equity market crashes, Fed cuts. In other words, traders - who hold the market hostage (as Powell first discovered back in 2013) - force the Fed’s hand, a conclusion supported by the surprisingly short lag time of the Fed reaction function. Indeed, as shown in the chart below, it usually takes 1 month on average - and no longer than three months - between the first 20% drop and an appropriate Fed reaction. Then, once the Fed gives in and cuts, it takes at most 4 months for equities to find a bottom, as the economic backdrop and Fed are supportive. This story seems to fit fairly well with the current environment: i.e. the Fed hiked in December, and then the equity market fell 20%. Meanwhile, current economic conditions remain relatively robust, and in line with previous slowdowns (and stronger than prior recessions), so the logical next step is that the Fed flinches – they have always in the past after all. The obvious problem is that the Fed is cutting because the economy is indeed entering a recession, even as market have already rebounded by over 10% from the recent "bear market" low, effectively cutting the drop in half expecting the Fed to react precisely to this drop, while ignoring the potential underlying economic reality (the one noted above by the bizarrely low neutral rate, suggesting that the US economy is far weaker than most expect). Ultimately, what this all boils down to is whether the economy is entering a recession, or - somewhat reflexively - whether the suddenly dovish Fed, trapped by the market, has started a chain of events that inevitably ends with a recession. The historical record is ambivalent: as Bloomberg notes, similar to 1998 and 1987, the S&P fell into a bear market last month (from which it immediately rebounded) following a Fed rate hike. The difference is that in the previous two periods, the Fed cut rates in response to market crises - the collapse of Long-Term Capital Management in 1998 and the Black Monday stock crash in 1987 - without the economy slipping into a recession. In comparison, the meltdown in December occurred without a similar market event. But the real reason why the Fed is now trapped, whether Powell knows it or not, is also the result of the most troubling observation of all: while many analysts will caution that it is the Fed's rate hikes that ultimately catalyze the next recession and the every Fed tightening ends with a financial "event", the truth is that there is one step missing from this analysis, and it may come as a surprise to many that the last three recessions all took place with 3 months of the first rate cut after a hiking cycle! In other words, one can argue that it was the Fed's official admission of economic weakness - by cutting rates - that triggered the economic contraction that was gathering pace as a result of higher rates and tighter financial conditions. If that is indeed the case, then the next US recession will begin just a few months after the Fed cuts rates. There is still a tiny chance that Powell will attempt to escape this trap, and instead of cutting rates will resume hiking, but the odds of that happening are tiny: as Bloomberg calculates, if the Fed does resume rate tightening later this year, it will be the first time in the recent history it did so after a drop in stocks this large.